Here's an excerpt from Where Love Once Lived near the beginning of the scene on Mount Bonnell in Austin, Texas. Rain covered the mountain and the whole city, and it wasn’t going to blow over in a matter of minutes, or even hours. Dark clouds hovered over their cars and blocked the sun and sky, covering them with an ominous darkness. “I never heard that,” Brian said. He’d hiked to the top with Karen once or twice back when they were in college. “Well, it must have been at least three times,” Susan said. Brian looked at Cindy and realized how much she’d matured in the past few months. It may have been the makeup and wedding dress, but it could have been because she was married and going out on her own and saying goodbye soon to her husband as he went into the marines. 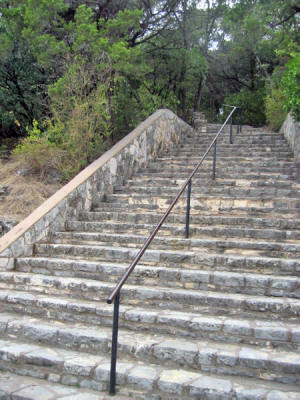 While a student at the University of Texas, I climbed to the top of Mount Bonnell many times. Usually with my buddies, the Combine, but sometimes with a special girlfriend. We felt safe there back then. If you go today, you'll see a sign saying to beware of crime in the area. I'm sure Mount Bonnell has a special place in the hearts of many Austinites. In Kit Frazier's Dead Copy, there is a scene on Mount Bonnell that describes the area perfectly.